Online poker is struggling in Nevada, but New Jersey online slots is making millionaires. Picture this. You are relaxing at the end of a long day, and decide to play some online slots. You log into your account, comfortable at home in your pajamas. After a few virtual spins all of the symbols line up properly and you know you have a big winner on your hands. You stare at the payout screen and see this number … $1,334,641.00. You stare in disbelief, and call your spouse over to verify what happened – that you just won more than $1 million playing online slots legally from the comfort and privacy of your home. That is exactly what happened to Morris County, New Jersey’s Cathy Ruela on November 6 of this year. Mrs. Ruela’s win set the record for the largest New Jersey online gambling payout since the Garden State began offering legal, regulated Internet casino and poker gambling on November 26, 2013. Along with Nevada and Delaware, New Jersey is just one of 3 states that have legalized Internet gaming for real money wagers. The life-changing win was also the third-largest gambling payout won by a New Jersey citizen this year, taking into account both online and land-based casinos. While the revenues for Internet gambling in NJ had not been what Governor Chris Christie predicted, they have been substantial and consistent. Not so in Nevada. The 2nd largest Internet poker site in the Silver State recently shut down, citing a lack of profitability. But New Jersey is the 11th most populous state in the US, claiming 9 million residents. And many of those Garden Staters enjoy playing some Texas Hold ‘Em, blackjack, baccarat or online slots conveniently from home. But before Ruela made her record slots spin, none of them enjoyed a 7 figure payday. Even with the massive payout, the New Jersey online gambling market delivers more than $100 million a year to the state. 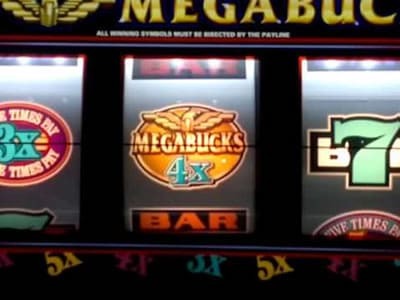 Ruela said that she was “… in a little bit of shock when it hit.” She also stated that in the physical New Jersey casinos, when you hit a big jackpot, bells are ringing and it is unmistakable to discover that you have a big payday on your hands. HarrahsCasino.com Vice President Adrian Bailey presented Mrs. Ruela with an oversized check in her home, which is only appropriate since the record-breaking spin took place there. He stated that, “It’s an awesome feeling to give away life-changing money to our customers.” He went on to note that New Jersey has a “great history with gaming” and said his company is thrilled to be a part of what is a historical first for the regulated online gaming market in the United States. Don’t live in New Jersey and would like to enjoy your own million dollar online slots spin? A few legal New Jersey online casinos, sportsbooks and poker rooms currently cater to US players, filling a need in the many states which have not legalized offering online gambling for US-based companies.